Black layer is upon or nearing our corn fields throughout North Dakota. Black layer is the physiological indicator at the tip of a corn kernel where the kernel was previously connected to the nutrient and moisture flow of the corn plant. Black layer forms when the hard starch layer has moved to the base of the kernel, and is when the maximum amount of dry weight has accumulated in the kernel. Heat units are critical when assessing where our corn crop is at for maturity and where it is likely headed. According to the NDAWN data we are continuing to be average or well ahead of average for heat units in the eastern third of North Dakota. The table below is a time course of accumulated growing degree day units away from the 30-year average for selected locations. In the extreme case the Oakes region is over 300 GDD units ahead of average, while in Jamestown they are right on the average. Most locations average 50-200 GDD units ahead of average for a typical planting date. What this tells us is that we are sitting in good shape to not only mature, by dry down the crop to where each individual producer likes to begin and finish their corn harvest. HOW FAST WILL CORN DRY DOWN IN THE FIELD THIS SEASON? Much of the early planted corn in the state has now reached or will soon (within a few days) reach maturity (black layer). Corn development has been substantially ahead of average this year, at least for many regions of the state. Growing degree accumulations have been similar to or greater than last year, which turned out to be an exceptional year for early maturity and field dry down. After reaching black layer, corn kernels do not add any additional dry weight and therefore lose moisture by losing water weight through evaporation. Reaching maturity by mid-September is good news with regards to field drying as the rate of moisture loss via evaporation largely depends on air temperature. Relatively humidity obviously plays a role in evaporation, but air temperature is usually the most dominant factor in ND. Warm air has the ability to hold more water vapor than cold air, so warmer air is able to draw more moisture out of the drying kernel than cooler air. 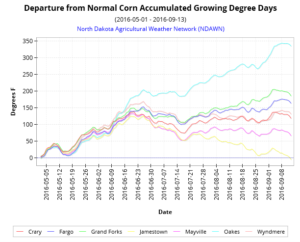 Since temperature declines rapidly in North Dakota in the fall, we tend to have fewer good field-drying days in the fall than our neighbors to the south. A good rule of thumb is that most field-drying that is going to occur in the fall will occur prior to November 1st. Furthermore, the chance of having rapid drying is greater early in September than in late October. Therefore, reaching maturity by mid-September positions the crop so that it will dry quickly and hopefully sufficiently so that at harvest little or no artificial drying is needed before putting the grain in the bin. Not only did we have relatively early maturity of the corn crop last year, we had exception weather for drying through the middle of October. Generally speaking, the weather in early October last year was well above average which hastened the drying process. Even with our early maturity this year, how well the crop dries will depend on the weather from now until harvest. Last year we found the drying rate to be around 0.75 percent per day for the period mid-September to mid-October for several hybrids. This rate of drying was exceptional as in other years we have found the rate to be more in the order of 0.25% to 0.33% loss per day for that period. If we have more normal weather, we can probably expect corn to reach the harvest moistures achieved last year about a week or ten days later than last year. Let’s hope our fall is more like last year than the average so we don’t have to worry about additional drying and pay for those costs!